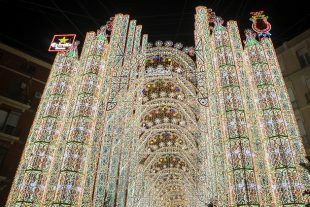 A major part of Fallas is its competitions. Paella championships, sports tournaments, fallera pageants, and of course the selection of the year’s best monuments. But the most dazzling battle takes place on the streets of Ruzafa… or rather, above them. Every year, a few casales compete to erect the city’s most mind-blowing streetlights.